When a scheduler creates a job, they can apply certain restrictions, e.g., the resource must hold a valid safety certificate to be on site. The resources that are available for allocation must match the requirements—and this is done comparing tags. Of course, this can be manually overwritten by the scheduler if necessary. Important! The "Multiple Resource Requirements" feature is available on Skedulo's latest web apps (excluding Skedulo Classic). Behind the scenes, the code for this feature is quite different from the previous method of assigning resource requirements. Jobs that were created before this feature was enabled can be assigned more than one requirement after the fact—it is backward compatible. However, if your organization uses custom triggers in Salesforce, then it is best that you plan its implementation with Skedulo. Contact your Skedulo Customer Success Manager if you require more details. Note: If the "Multiple Resource Requirements" feature is activated, "Suggest" will be temporarily disabled on both the job details swimlanes and the job list in all consoles. This will be re-enabled in a future update. Tip! How can you tell if "Multiple Resource Requirements" is enabled for your organization? A quick way to tell is to open a job's details ("Job Details" view) and look at the "Resources" column. If you see "Add another requirement" then the feature is enabled. A scheduler can stipulate a job's resource requirements when they create the job. 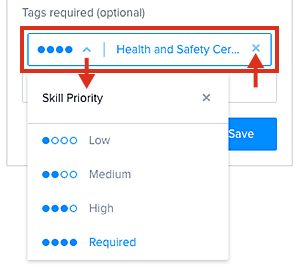 In the "Create a Job" modal there is a tabbed button named "Requirements," this is where combinations of resource numbers and the tags (or skills) they require can be set. How many resources are required? : This number sets the minimum number of resources, with this skill (tag), or these skills, that are required for the job. The default value is one. Tags required (optional): Tags represent the skills the resources must have to be allocated the job. Small empty blue placeholders are placed on the related job card in the scheduling console, representing those that have yet to be allocated. A small resource requirement icon is placed on the related job card which (on hover) displays a pop-up containing the tag requirements for the job. Click on the options menu and select "Edit requirement." The number of resources required can be set using the quantity stepper. Next, click in the field named "Search to add tags" (this will give a pre-defined list of skill tags). Select a tag from the list. Select a "Skill Priority" (the options provided are: Low, Medium, High, or Required). Click the "Save" button. The skill requirement is now specified. To add additional requirements, click on the text link "Add another requirement," then repeat the process above to specify the number and skills preferred. Figure 4. Two skill tags being added to a job. Figure 5. Specifying an additional requirement for a job. When adding multiple skill requirements to older jobs (i.e., those created prior to activating the "multiple resource requirements" feature), schedulers are warned that doing so might activate custom triggers in Salesforce (if they have been configured by their organization), so they may act accordingly. Figure 6. A warning is seen when an older job is to be converted for use with multiple resource requirements. Where skills (tags) are set as "Required," a filter is applied (in the swimlanes) to identify only those resources who are both available and match the tagged conditions, i.e., any suggested resource must have this skill or qualification. However, if the scheduler wants to see all their available resources (or just those that meet one specific requirement), they can do so by changing the filter just above the resource list. Note: The swimlane filter defaults to "Meets require tags" when the browser is reloaded. Figure 7. A job with resources that have been filtered to meet the resource requirements. Figure 8. The swimlanes filtered to show all available resources. Figure 9. An allocated skill or tag and its priority, side by side. There are several ways to allocate resources in Skedulo. In the "Job Details" view, jobs with multiple resource requirements can be allocated via a modal invoked from the available resource list (next to the swimlanes). With the aid of a mouse, roll-over one of the resources—a button (a white plus on a blue background) will appear. Click on the button to begin allocating the resource. If the resource's tag(s) match a single requirement, Skedulo will automatically assign them to that resource requirement. In the example below, Joshua is "Health and Safety Certified" and when the button is clicked he is automatically assigned as one of the two resources required. If the resource has multiple tags matching more than one requirement, then a modal pop-up allows the scheduler to manually select which requirement they want to assign to the resource. In the example below, Dexter has several skills which match several of the requirements. The pop-up modal allows the scheduler to choose which requirement to assign. Dexter's electrical certificate is matched one of the requirements, then saved. Figure 10. Allocating resources to jobs with multiple resource requirements. Click the "Add Resources" button to open the "Select Resources" modal. From the resulting pop-up modal, resource(s) can be selected (or checked) based on the filters provided, e.g., "Travel distance from home." Save the resource selection by clicking the "Save" button. An additional modal opens named "Select resource requirement." Using the information provided, an informed decision can be made on how best to assign the resource. Warnings indicate if the resource does not match a requirement. Mouse-over the warning icon(s) for a description of the problem. Note: A scheduler can choose to ignore the warnings provided and assign resources that do not meet the requirements—the choice is theirs to make. Note: If multiple resources were selected and one of them has only one matching skill then they will be automatically assigned to that requirement. If multiple resources were selected (in step 2), the next resource (who has several skills) will be presented in a new "Select resource requirement" modal. If only one resource was selected (in step 2), the modal will close. The assigned resource(s) will appear with the resource requirement in the "Resources" column. Again, warning icons appear if the allocated resource does not meet the defined requirements. Figure 11. Assigning multiple resource requirements using an alternative allocation method. It is possible to create a recurring schedule using an existing job with multiple resource requirements as the template. On creation, the job's requirements are applied to all the jobs in the schedule, however, any subsequent changes made to the schedule will only apply to the one job being updated.